Safflower (Carthamus tinctorius L.) is a highly branched, herbaceous, thistle-like annual plant. It is commercially cultivated for vegetable oil extracted from the seeds. Plants are 12 to 59 in tall with globular flower heads having yellow, orange, or red flowers. Each branch will usually have from one to five flower heads containing 15 to 20 seeds per head. 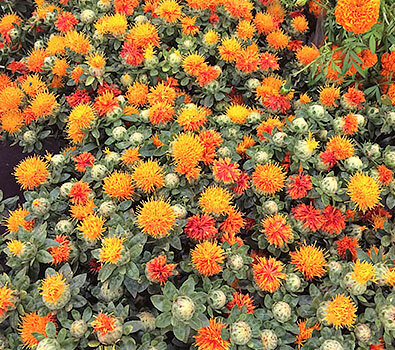 Safflower is native to arid environments having seasonal rain. It grows a deep taproot which enables it to thrive in such environments. Safflower is one of humanity’s oldest crops.